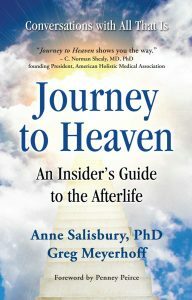 The following material is taken from our new book, Journey to Heaven: An Insider’s Guide to the Afterlife. The insiders are Physsie (Anne’s mom who is now on the other side) and All That Is (a loving group of nonphysical beings with a higher perspective). What would it be like if you knew heaven before you arrived there? What if you felt you had options in transitioning? What if you really knew what it was like to cross over to the other side? You would probably feel a tremendous sense of calm and ease in your life, and you would likely have more confidence. It would make your life on Earth and your afterlife more enjoyable, and you would be more enlightened as you walked your own path to heaven. Heaven is what you make of it. Depending on your level of awareness, you can determine your options before and after you arrive on the other side. If you want to be supported in a loving transition, then you create loving beings on both sides who help you anyway they can. If you are expecting pearly gates or a judgment day in the afterlife, then you can create that too. If you don’t really know what you want, then your beliefs and unconscious thoughts will create your world for you, and you can be surprised when you arrive in heaven. In Journey to Heaven, we explore the journey to heaven from two main viewpoints. As professional intuitives, we share firsthand accounts from Anne’s mother and others who have recently passed, which we received clairvoyantly. We also give you the higher perspective of All That Is as intuitively channeled through Anne. Through these pages, you will be shown where the potholes are so you can avoid them. Like travel guides, we will let you know what you can expect ahead. Life and the afterlife can be so enjoyable when you are well prepared for your journey. Heaven is still heaven, the place you go when you die, but it may just be a little different than you thought it would be. Question: So is this heaven? Yes. Heaven is a resting place, or way station, where you appreciate yourself. It is developed on the other side to allow you time to recuperate. During your recuperation, you see loved ones around you. You feel whole, complete, and loved. Once you are on the other side, you breathe easier and experience simpler movements, more fluidity, less constraints. There is no real delineation between this life and the next. It is a continuation. Question: What is it like to see family and friends on the other side? Your experience of seeing loved ones differs depending upon your level of awareness. When you desire to see loved ones, they appear. But you realize their appearance is of your own making, so you attribute less significance to them. You say to yourself, “I am a loving being. I am surrounded by love,” and you create within yourself and your universe the experience of love because you are in charge. If you are not in love with yourself enough yet and it feels incomplete when you say, “I am surrounded by love,” then you feel lack. When you desire another’s love to fill you, you yearn for the experience of being surrounded by love because you have not filled yourself, so you create loved ones around you to fill that emptiness. Your experience on the other side is dependent upon the amount of love you have for yourself. To feel no lack, you must love yourself enough to accept yourself as God, creator in your realm. So filling yourself with love is a goal during your life, during your stay on the other side, and during your next life. Question: If you do your best to gain awareness while you are alive, is there less of a life review on the other side? When you review your life, you remember to appreciate physical form rather than criticize it. You notice how form gives you solid lessons. You are also aware of how frustration increases until you do what is required to receive the outcomes you desire. You notice how you are meant to experience joy and appreciation. Once you do this, you move along. When you are not experiencing joy, you know you have missed the mark. As for Physsie, she did not have to review much because she reviewed her life before she died. She got tired of reviewing it, and that is what it takes. You have to get tired of it by answering all of your life’s questions so you are complete. Physsie did this by writing and correcting her obituary, putting her family photos in albums, reading old letters, and talking to friends and family on the other side through Anne. She reviewed her life and felt complete with it.